If you are a fitness enthusiast and are looking for an applicant that can help you improve your muscular strength as well as enhance your stamina, you can’t go for an easy stationary exercise bike that ever general-user is using. You might want an indoor cycling bike that is designed especially for hard and serious workouts. Sunny Health and Fitness Indoor Cycling Bike SF- B1203 is one of the best budget indoor cycling bikes available on the market. It has a good price, it provides you with sturdy exercise feeling and it’s not suitable for those want easy things. Let’s find out the advantages and disadvantages of this bike in this review. Sunny Health & Fitness headquartered in Los Angeles, California and have operated for over 15 years. Sunny doesn’t produce fitness equipment directly, but through top manufacturers in Taiwan and China. At present, the company is a leading distributor and importer of high-quality health and fitness products. The company has a wide-range of products, including treadmills, ellipticals, bikes, rowers, steppers, weights and other fitness accessories. Sunny Health & Fitness commit to providing only the best exercise and health equipment with competitive price. Since the company’s No.1 goal is to satisfy every customers’ need, their customer service is excellent when they always give the customers the best support. Overall, Sunny Health & Fitness is a big brand that you can trust. Sunny SF-B1203 is an Indoor Cycling exercise bikes. A normal indoor cycling bike looks like an upright bike but smaller and the seat of an indoor cycling bike tend to be lower. The pedals are always under the seat and the handlebars are in front of the seat, and quite low too. 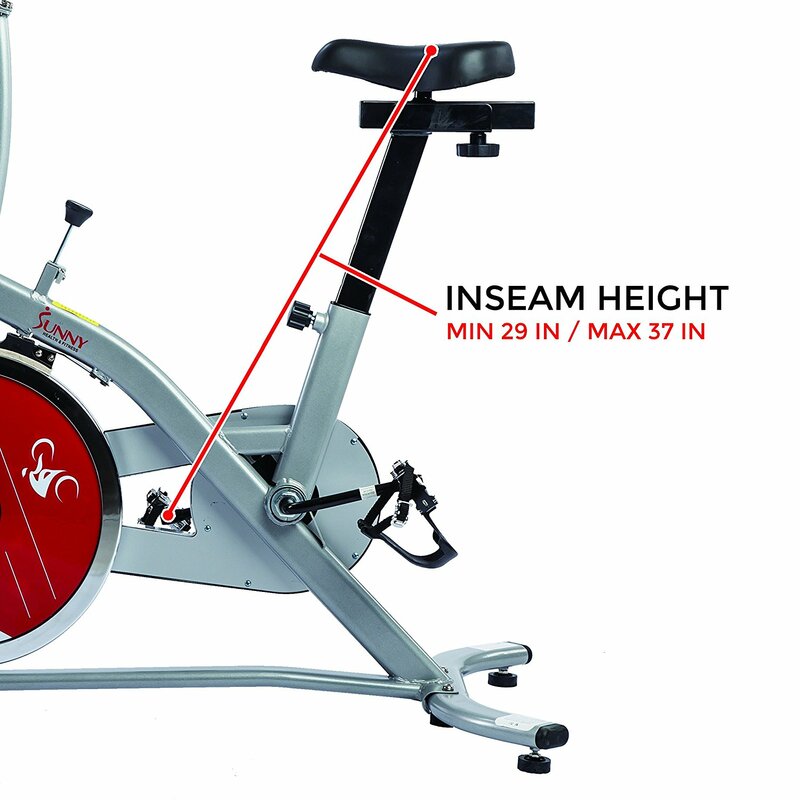 Indoor cycling bikes always have a chain drive mechanism and Felt Pad Resistance, it does not come with a motor to support your workouts as well. The design seems to be too simple and too humble in comparison to stationary bikes (upright bikes and recumbent bikes), but it will provide you with a real cycling feeling of a sports bike. Giving you the real cycling feeling of a sports bike is also the purpose of Indoor Cycling exercise bikes. So, if you are a sporty person and want serious training for your strengths and muscle, you definitely should go for an indoor cycling bike. The advantages also are the disadvantage, the bike will put a lot of stress on your joints, especially on your back, neck and knees, thus it is not suitable for physical rehabilitation/physical therapy treatment. 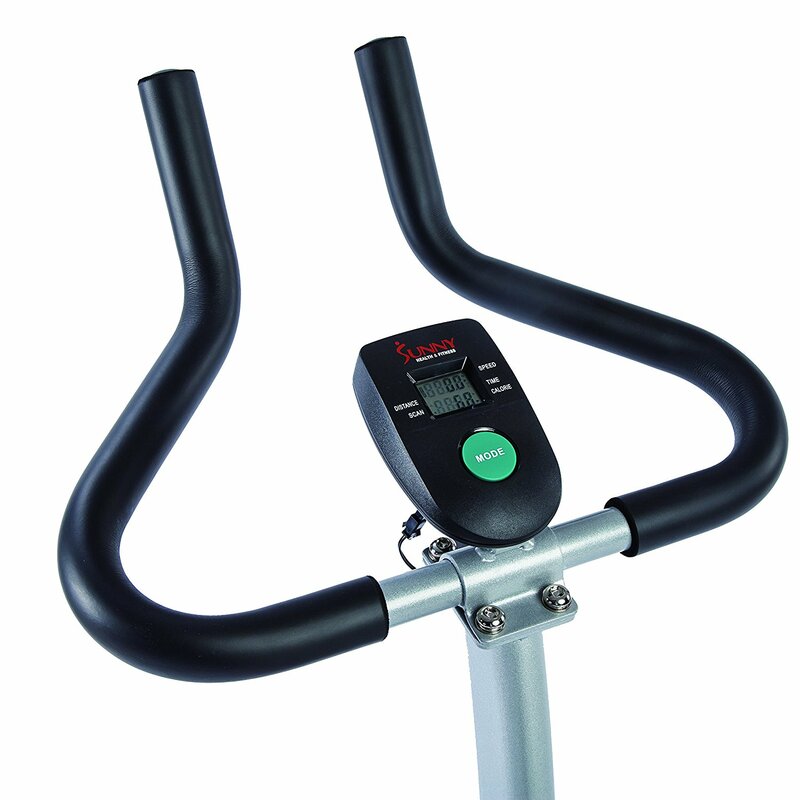 – This upright bike is quite compact, which is suitable for small apartments and small rooms. Its dimensions are 30.7L x 24.8W x 48.4H inches (78 x 63 x 123 centimetres), which means this bike takes only 5.3 sq feet of the ground – really small. Its weight is 61.7 pounds (28 kg) – really lightweight. When it arrives, it comes unassembled, thus you need to assemble it by yourself, however, it’s very easy. 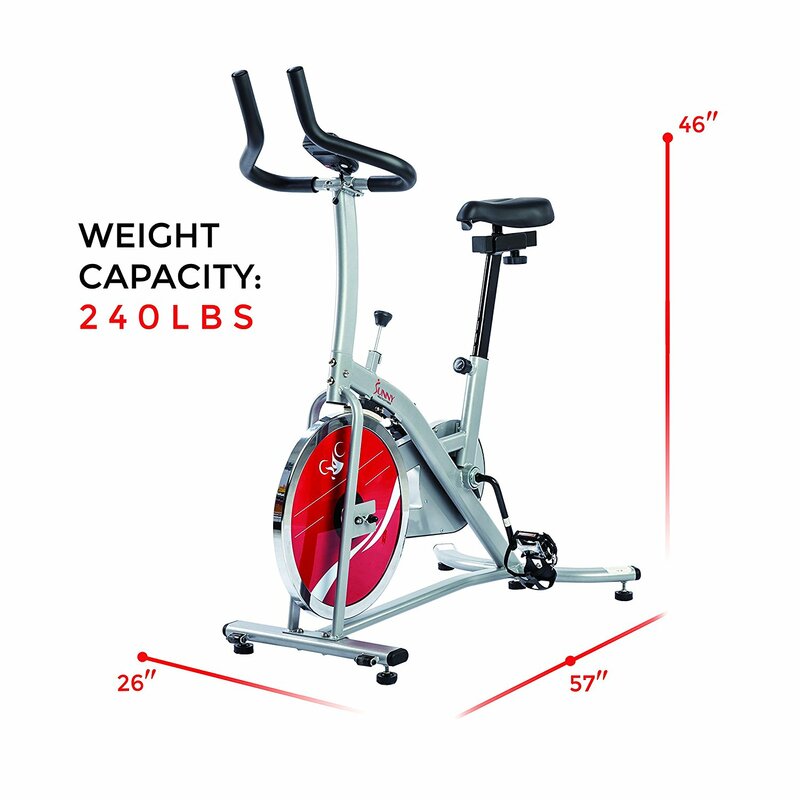 The bike supports up to 240 lbs and 5’2″ to 6′ users. – The build quality is sturdy and gives you the solid feeling when you cycling. – There’s a small display to show your workout data. – Sunny SF-B1203 is simple in design and simple to use. You just need to climb on the bike and pedal. – The seat is hard and uncomfortable. However, as an Indoor Cycling Bike, when you are pedalling hard, your bottom tend to be a little above the seat. There won’t be direct contact, so you don’t need to worry about the seat. – When you’re pedalling intensely, the bike shows a little shaking, not totally firm. 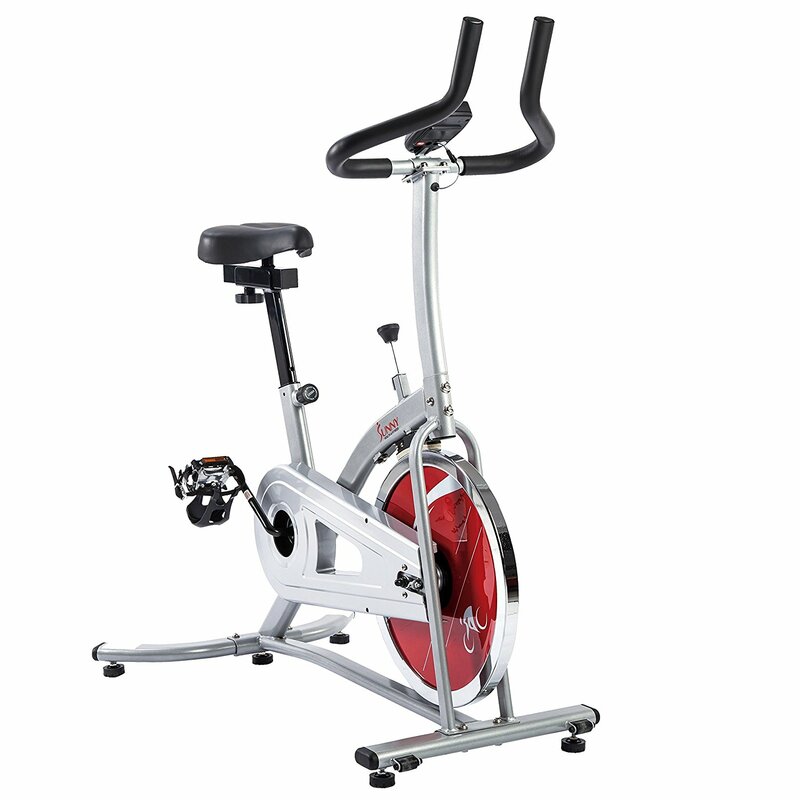 Sunny SF-B1203 has a good-looking appearance with white, red and black – tired of all the boring dark grey exercise bikes on the market? Have a look at Sunny’s bikes, they are all accented with bright colours. Sunny SF-B1203’s frame is made from steel tubes, including a longitudinal bar and two front and rear bars. The longitudinal bar is a single piece, giving more sturdiness than a two-piece bar. The front and rear bars are attached to the main frame by bolts, making the bike more stable while pedalling. The front bar has transport wheels for easy movement, giving you the easiness to move your workouts around the house. By leaning it forward on its transport wheels, you will be handling less than 1/2 of the bike’s total assembled weight. There are two levellers under the front bar and three levellers under the rear bar, which give you the ability to place firmly this bike on a floor that has variation. These levellers are made from rubber, making the bike not slide even if you’re cycling hard. 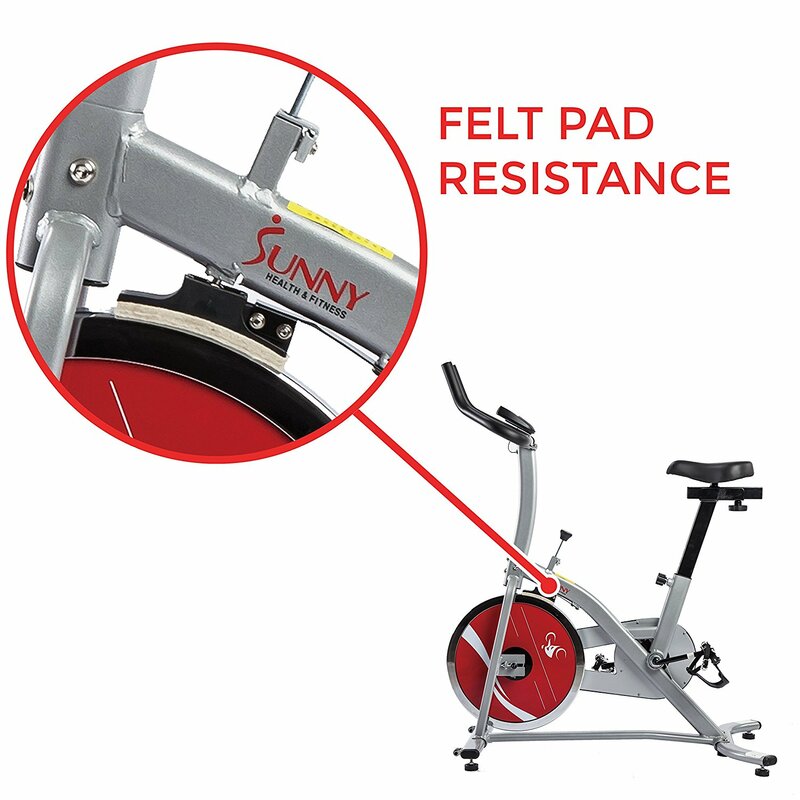 Sunny SF-B1203 is equipped with a smooth felt fabric brake pad system which allows for various tension levels providing an intense workout thus burning more calories, resulting in a toned and better you. Casual fitness enthusiasts will then be able to work out twice as hard resulting in a shorter but more intense workout. 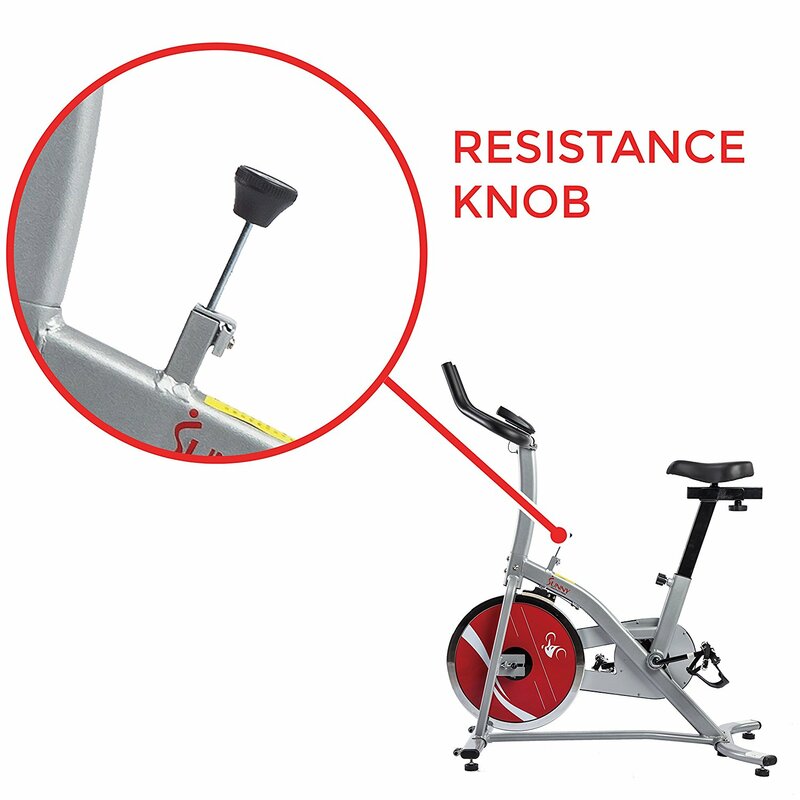 There is a knob below the handlebars for resistance tension adjustment. To increase the tension, turn the knob in a clockwise direction. To decrease the tension, turn the knob in a counterclockwise direction. For safety purpose, If you want to stop the bike immediately, you can simply push this knob down. The impression of those who use indoor cycling bike for the first time might be that the seat is too low for them. However, they did that intentionally. This seat design forms you in a posture like you’re riding a sports bike that requires you more effort to pedal. I will describe this posture more detailed in section 3 below. 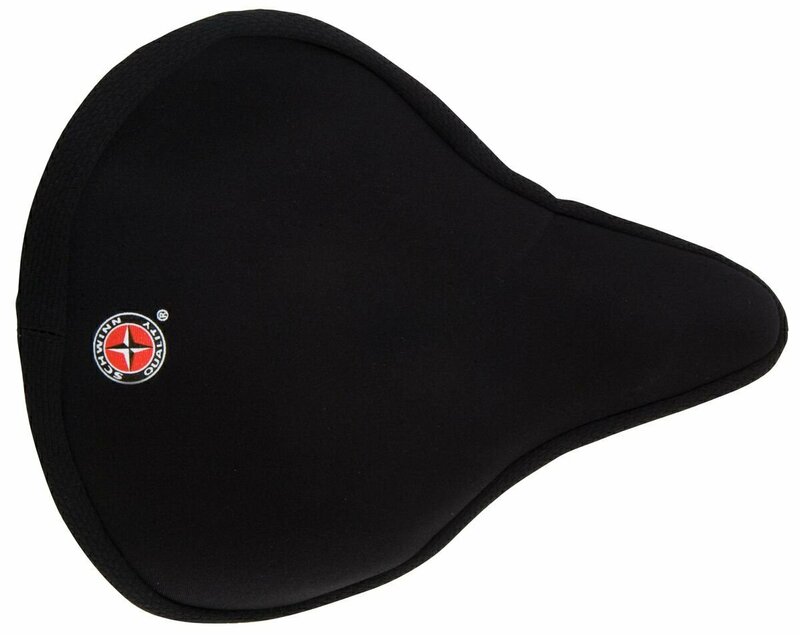 Basically, this seat is designed like a real bike seat, and it’s really hard. You won’t feel comfortable when sitting on this seat. So, you might need an additional Cruiser Gel Seat Cover – it’s a lot more comfortable. Or, just leave it like that – it’s okay since it’s an indoor cycling bike and you won’t put much stress on your bottom while pedalling. The seat can be adjusted backward and forward, upward and downward to fit your body height. 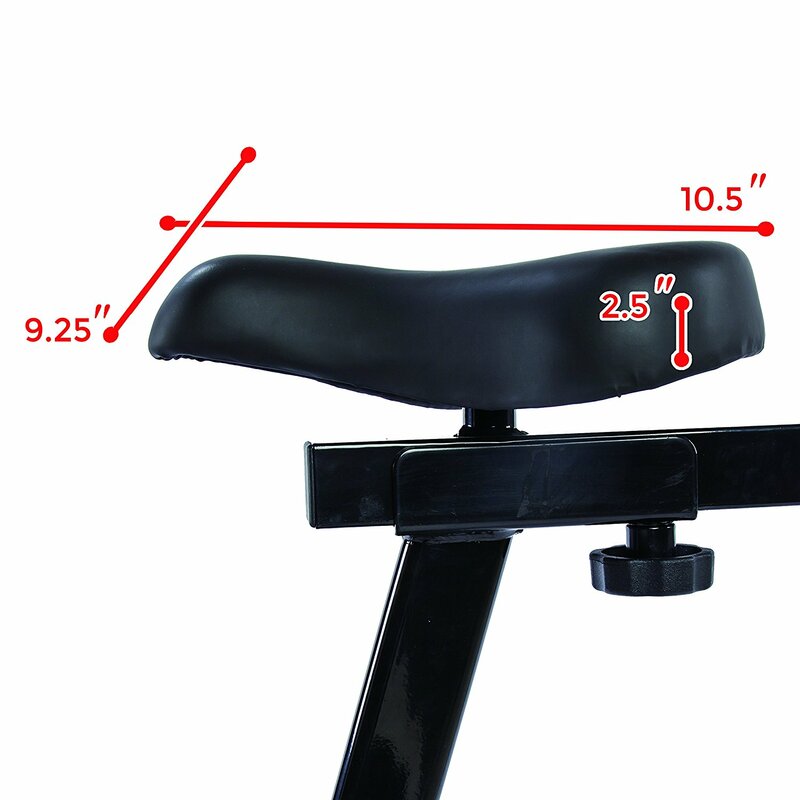 Sunny SF-B1203 doesn’t come with a backrest because your upper body will be forward and downward while workout – you cannot use the backrest if there is any. The handlebars are in front of the seat, a little above the seat but still quite low. This design is specialized for intense workouts – your body will be along a horizontal line while you are holding the bars, creating a dynamic posture that allows you to pedal fast and strong. The handlebars are also rubber foam paddle to give you more comfort. Handle bars are not integrated with Hand Pulse Sensors for monitoring heart rate. It is a drawback since measuring your pulse rate is important for exercising correctly and efficiently. Sunny SF-B1203 has caged pedals under the seat that will prevent feet slip and give more support while pedalling. The straps can be adjusted, giving you proper alignment for efficient pedalling with ultimate control. They are also quiet, so you can enjoy watching movies or listening to music while exercising. However, the material of these pedal cages is plastic and it’s also not oversized, which makes your foot hurt if you pedal by your bare feet. However, they are suitable for the kind of exercises that this bike offers – almost your body weight will press on your feet, thus, the cages need to be tight. It’s necessary to wear a pair of sports shoes during workouts, otherwise, your toes will get really hurt. Sunny SF-B1203 is equipped with an LCD display for you to track your workout progress. Exercising with this Digital Monitor screen display will showcase the distance and time to keep you focused on achieving any type of personal fitness goals. With a convenient scan mode, you can choose to have these features continuously repeated to keep up with all calculations. There’s only one button, and it’s super simple to use the display. That’s all about the design. The bike is really simple in design, which is reasonable for the price. But will Sunny SF-B1203 provide you with good pedalling feeling and fitness efficiency? Let’s find out. Workout posture is great for enhancing muscular strength and stamina. Pedalling experience is firm, sturdy and smooth. Shaking might appear when you’re in intense workouts. Not support your joints, and there will be a lot of stress on your shoulders, necks, knees and ankles. Pedalling on Sunny SF-B1203, your body will be along a horizontal line – your upper body will be forward and downward, your both hands will grasp the front handlebars, your bottom might not touch the seat and almost the stress will locate on your legs, especially on your knees, feet and ankles, your shoulders and necks will be stressed as well. This posture is really dynamic and requires you to put more effort. You will practice your whole body seriously and achieve muscular strength, as well as stamina. Unlike other stationary bikes, you might not be able to ride an indoor exercise bike hour after hour. Instead, you will be exhausted quickly after 30 minutes – but it’s a good thing to enhance your stamina. Since this bike is specialized for intense workouts, those have injured joints, back or shoulders should not use this bike. 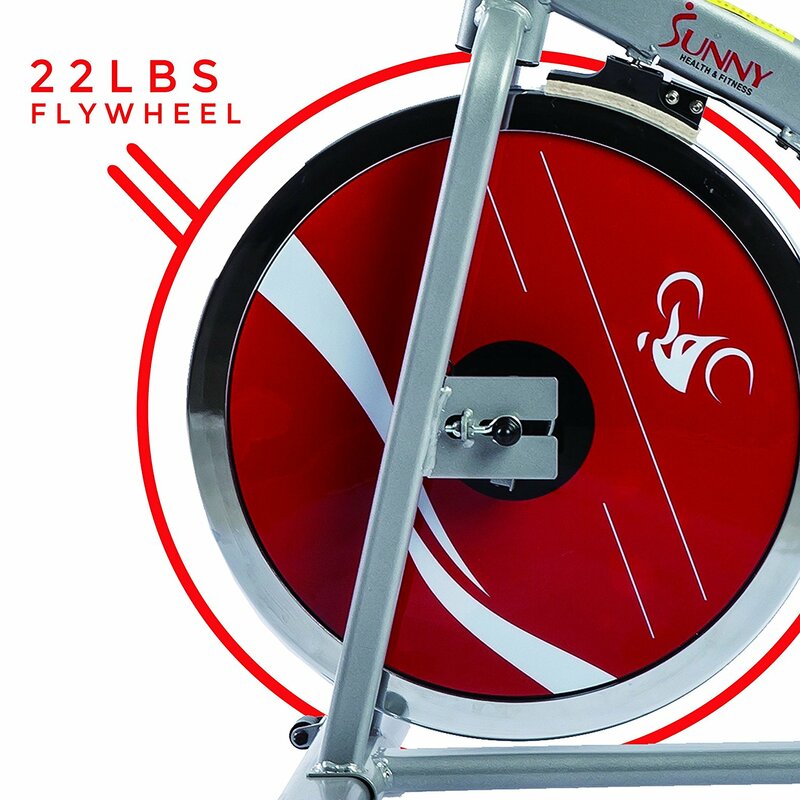 “The heavier the flywheel, the smoother the ride” – Engineered for speed and stability, Sunny SF-B1203 has 22 lb Flywheel at its heart to create more momentum for longer periods of time keeping your workout going the distance. This is the best flywheel in the term of pedalling feeling like you are really riding outdoors. when you start pedalling, your first several rotations are quite hard. And it gets easier and smoother after every rotation, even, you will need to produce a force to slow down the speed. Together with the special posture, you are assured for effective workouts. The flywheel connects with the pedals by chain drive mechanism. And there is a smooth felt fabric brake pad system for adjusting workout tension level. All the mechanical systems are basic, but it does provide you with a real pedalling feeling, and thanks for Sunny’s abundant experience, there won’t be any annoying noise. The bike will stay firmly, without jerky and out of control movements almost the workout time, however, in intense workouts, shaking might appear. Overall, this bike provides good pedalling feeling. Noise: There is no annoying noise while practising, but just a soft whirring sound. Heat: There is no backrest on this bike, which mostly brings discomfort, but also makes it so spacious. You won’t feel hot and humid even after a long period of exercising. Dust: The design of Sunny SF-B1203 is really simple, so you do not need to worry about dust and dirt. And if the bike is dirty, you can easily clean it with a washcloth and clean water. You don’t need to plug this bike into an electrical outlet since it doesn’t use electric power to operate. However, you will need 2 AA batteries for the console. They are included in the package. Sunny SF-B1203 has the price about more than a hundred dollars, making the bike so affordable. The important thing is that the bike has a good quality. It is quite a good deal. As said above, you need to assemble it yourself as it arrives unassembled. If you don’t like to assemble it yourself, you can pay an additional $70 for an Exercise Bike Assembly Service Package. However, it’s really easy to assemble Marcy NS-652, and I think you will enjoy the assembly section, making the bike all your like the experience that IKEA products bring to customers. – 3 Year – Structural Frame. – 90 Days – Other Parts and Components. That’s the warranty plan of the manufacturer, you can also buy added protection plan from the retailer if you want. However, I think the manufacturer plan is enough. Sunny SF-B1203 has a high Amazon product’s star ratings in all online stores such as Walmart, Amazon,…so basically, we can trust the quality of Sunny SF-B1203. What size does this bike fit? Some said that they are about 5’10” and too tall for the bike. However, some said they are 6″ tall and the bike is perfect fit them. In my perspective, those said this bike was small might don’t know how to use this bike properly. 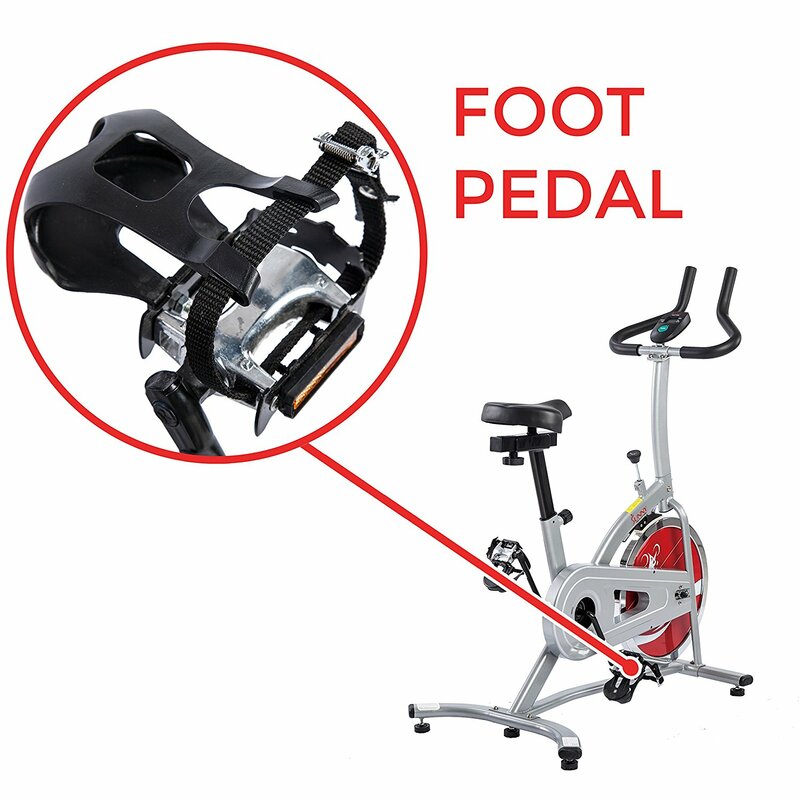 Since it’s not a stationary exercise bike, it won’t be comfortable for you to sit erect and pedal. Instead, it requires you to be in a dynamic posture and your upper body must go forward and downward. That’s why who are used to pedalling on a stationary bike might think this bike is so small as they cannot sit erect while pedalling on this bike. Can you swap the seat for a different one? Sadly, you can’t since the seat is attached directly to the bike. Instead, you can purchase an additional seat cover as I recommended above. What do you use to cover the seat? You can purchase an additional seat or simply use a towel. In the customer reviews section, There are many positive reviews as the bike’s construction is superb and provides a quiet ride, the assembly is easy and the wonderful workout feeling the bike offers. 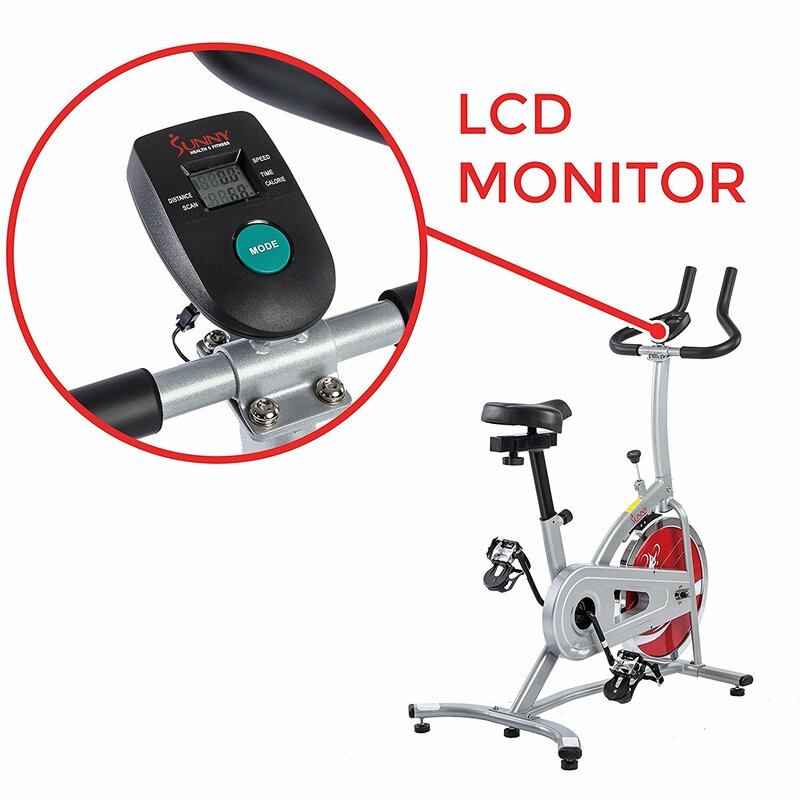 Those who had experience of riding on an indoor cycling bike rated this bike really high as they know what kind of exercise this bike supports and how to use the bike properly. But also there are some negative reviews as there were some problems from the factory assembly, such as obnoxiously loud clicking noise coming from around the flywheel when pedalling – it’s quite annoying, however, you can contact Sunny and require them to replace it for you. Thus, make sure that you check the bike carefully when it arrives and contact the manufacturer as soon as possible. Many complained that the bike was too small – Maybe they don’t really know of this kind of exercise bike as said above. Also, some said that this bike was hard to ride and the seat was uncomfortable. Yes, there are some drawbacks, however, it’s still a good deal after all. Sunny SF-B1203 is a great applicant for those want serious workouts. It has a good price and good quality that can motivate you to achieve your fitness goals. It’s suitable for enhancing stamina and improving muscular strength. And it’s not suitable for those injured or those just want easy workouts, in another word, it’s not suitable for physical rehabilitation/physical therapy treatment.